Hello everyone. 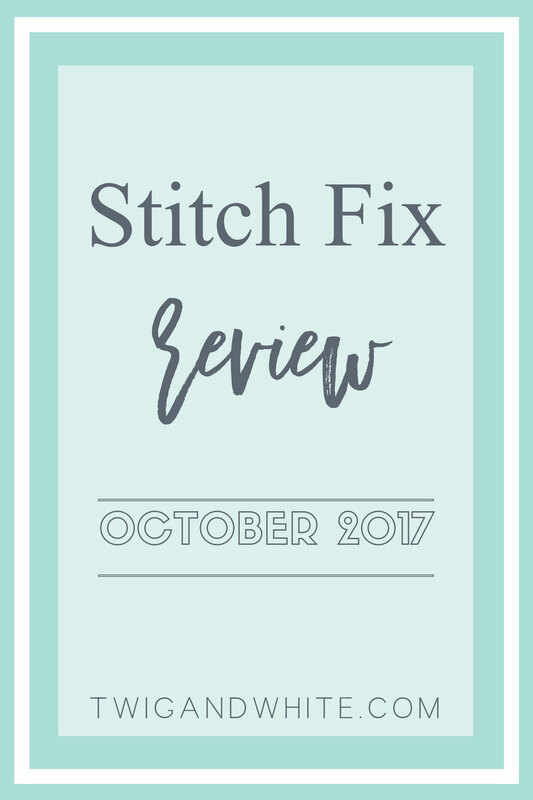 I’m excited to be back with my October Stitch Fix. This month feels like my stylist has finally found the right combination of both casual and dressy and I’m super excited to share all of that with you. This scarf is beautiful. The colors are so vibrant and rich and are perfect for fall! I love me a good infinity scarf and this one is just the right length for layering and has lots of volume. Some cheaper scarves fall flat and look like long tube socks around my neck. I don’t like that look and this one is perfect. Your Takeaway: One simple way to update a tired wardrobe is with accessories. 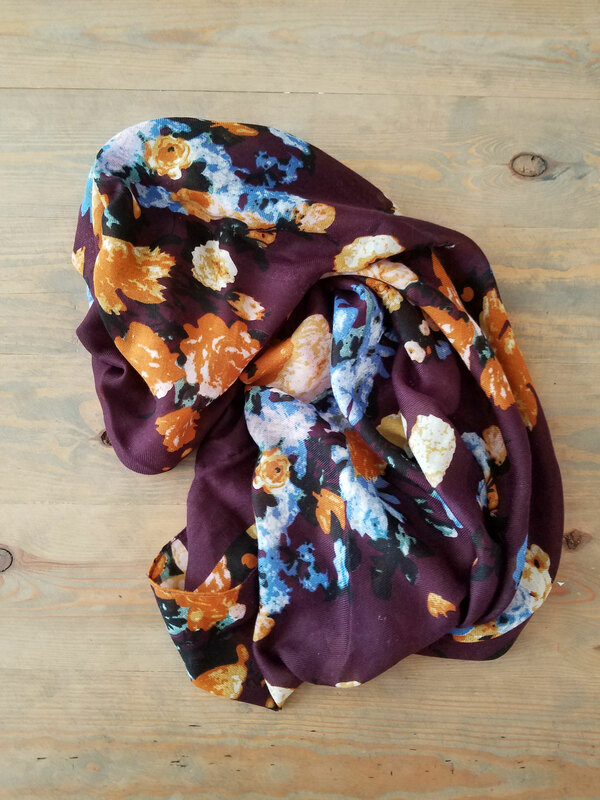 Add personality to a drab outfit and elevate it with a pretty scarf. Infinity scarves are super easy to wear vs. open ones. In the early fall, before it gets too cool outside, opt for lightweight fabrics that wont make you too hot. 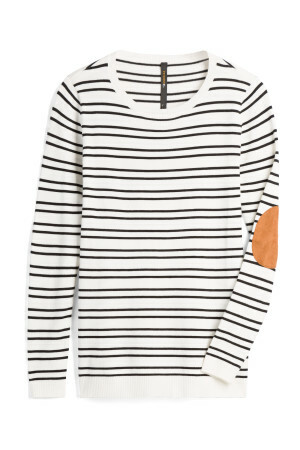 I can never turn down a good stripe and in the form of a lightweight sweater with elbow patches? Yes, please! The fabric is light and stretchy but not at all see-through. I can see layering this over a chambray button down or layering a fun scarf over it. I also really like the length of this top. It’s a little longer than normal which is great for not pulling up in the back when I sit down. Your Takeaway: Basics don’t have to be boring. Fun details like the elbow patches take a simple top and make it into something special. Finding basics that are elevated a bit with a special detail is a great way to look unique even when going with something simple. I gravitate toward gray a lot! It’s an easy neutral that I never tire of. 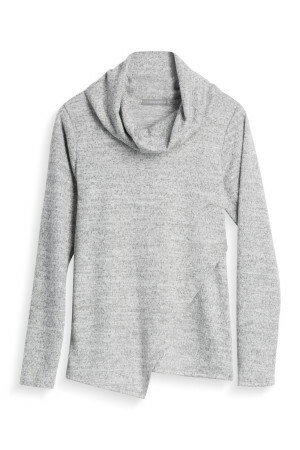 The fabric is lightweight and feels like a cross between a sweatshirt and a sweater but it’s crazy soft. Again it’s pretty basic but the asymmetrical hem makes it more unique and special adding interest to something that could be kind of blah. I also really think the asymmetrical him looks very good on my curves compared to a straight hem top. The lightweight fabric means I can wear it soon but layer it later. Your Takeaway: Just like with the elbow patches on the top above, even when shopping for basics for your wardrobe, look for options that have a special or unique detail. Why wouldn’t you want to feel a little special even when wearing basics? 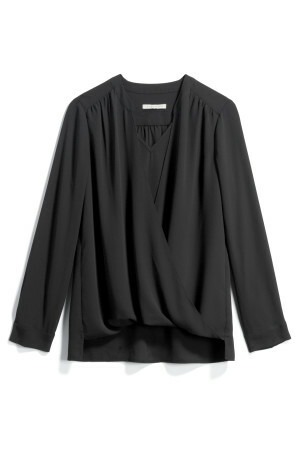 A girl can never go wrong with a classic black blouse and this one is just that! A friend gave me a similar blouse in black that is sleeveless that I wear a lot and now I have one for the cooler weather too! This one has an under layer that keeps the girls covered which is great. The drapey fabric hangs just right in all the right places without feeling frumpy. Your Takeaway: A classic blouse in a neutral color is a must in any woman’s wardrobe. A blouse like this can be work with jeans for a night out, worn with a pencil skirt for a dinner or date night or worn with a great pair of slacks for the office. A classic style will never feel out-of-date so it’s more of an investment piece you’ll turn to again and again. Liverpool is a brand I’m new to after trying Trendsend and Stitch Fix. I find the sizing really true for my body and shape and the quality is worth the money. My stylist called these pants leggings so when I first pulled them out of the box I wasn’t sold on them. Hate on me all you want but leggings aren’t pants. 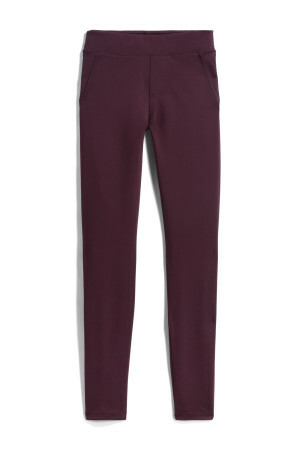 The color is beautiful; a fall appropriate burgundy / wine color. When I put them on, while they are skinny, they are definitely heavy like a pair of pants, not thin and almost see through. They have seaming like a pair of dress pants would and while skinny, they aren’t tight like leggings. As a woman who is well beyond the age and size of wearing leggings and pants, these actually look good and flatter my body. Your Takeaway: Even when you aren’t sure of something, don’t be afraid to at least give it a try. It is normal for something to look funny on a rack or lying flat but end up looking amazing on your body. Of course the opposite can also be true so always be willing to at least try something. If something doesn’t work, take it off and move on. If your work environment is more casual like mine, a pair of pants like this can be a nice alternative to jeans all the time. (That was a big selling point for me.) Wear them with tall boots or dress them up with a great pair of heels or booties. I’m thinking of taking a break from Stitch Fix for a couple months over the holidays so next month with likely be my last for a while. That’s the beauty of this service. You aren’t obligated to continue and if you need a break or want to quit, you can without any penalty. This fix was again at the top of my list for good pieces. I kept all five items not out of cost savings but because I loved it all. Investing in quality pieces that will be worn again and again is what I wanted to accomplish and after doing this for nearly a year, I feel like I’ve nearly built the kind of wardrobe I was wanting.